Comedienne Lucille Ball entertained audiences for decades and is still known for her on-screen hijinks on "I Love Lucy." Halloween, or your next costume party, is an opportune occasion to dress as the beloved peppy redhead. Don a red wig and a '50s-style dress and you'll be easily recognized as the iconic funny lady of the 1950s. Make your costume stand out by making a custom apron or by putting together one of your favorite "Lucy moment" costumes, such as chocolate-factory Lucy or grape-stomping Lucy. Put on a '50s-style polka dot dress from a vintage or thrift store. 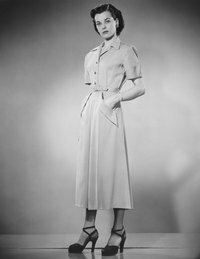 A shirtwaist-style dress -- a collared dress buttoned down the front to the waist and belted with an A-line skirt on the bias -- makes for a classic Lucy look. Tie a white half-apron around your waist. The apron can have square or rounded corners. Wear skin-toned stockings and high heels. The heels need to be around 2 inches high. They can be spectator pumps that coordinate with the dress, sling-backs or a plain pump in a dark solid color. Hang a medium length -- 18- to 20-inch -- strand of pearls around your neck. Earrings should be coordinating pearl studs or teardrops. Apply pink blush or cheek stain high on your cheeks. Use false eyelashes to accentuate your eyes. Paint your lips with red lipstick. Powder your face with a light-colored powder to recreate Ball’s pale complexion. Wear a red, curly wig. Pull the hair in the wig up into a French twist, leaving the ends free to curl out of the top of the twist. Secure with bobby pins. Or apply temporary red spray hair coloring to your own hair. Curl your hair into ringlets. Style into a French twist same as above and spray with coloring. Locate a graphic of the “I Love Lucy” heart online. Print the graphic onto a piece of paper. Cut the heart out of the paper. Position the heart onto a vintage apron and pin down to secure. Thread your needle with embroidery floss. Insert the needle under the apron and up through the paper and the point of the heart. Stitch a straight stitch. Make even straight stitches through the paper, all around the outline of the heart. Knot the end of the embroidery floss and snip the end when complete. Re-thread your needle and do the same process for the “I Love Lucy” lettering. You can use a straight stitch or use consecutive “X” stitches for a different look. Knot and snip the floss when you have finished. Place your hand in the middle of the heart and gently pull the paper from the stitches. It will likely come off in pieces. Pull all of the paper free from the stitches. Dye your short-sleeve, long lab coat and chef hat pink with liquid or powdered dye per the instructions on the packaging. Let dry. Remove the buttons from the lab coat and sew on the black buttons. Add additional buttons to the coat to make it look as though it buttons all of the way down if it doesn’t. You can pin it shut, and the buttons will appear to be functional. Lay the collar of the lab coat onto the black felt and trace around it with tailor’s chalk. Cut the shape out of the felt. Snip 1/4 inch from the ends of the collar. Pin the felt onto the collar so the pink is showing on either end (by the throat) but the rest of the collar is black. Stitch on by hand or with a sewing machine using a straight stitch. Measure the circumference of the sleeve openings. Cut two pieces of felt 4 inches wide by the length of the circumference. If the sleeve openings are 12 inches wide, you will need two pieces that are 4 x 12 inches. Pin the felt around the sleeve, lining the edges up flush. Stitch in place by hand or with your machine using a straight stitch. Fill the top of the chef hat with batting or stuffing to create volume. Print a nametag with “Lucy” and the “I Love Lucy” heart from your computer. Pin onto the lapel of the coat. Cut a piece of 1/2-inch foam board to 18 x 20 inches. Cover the board in tin foil and secure with tape on the underside. Place a 15-inch-wide piece of wax paper over the foil to look like a conveyor belt running across. Tape underneath. Glue chocolate-covered cherries to the wax paper with a glue gun. Line them up on one end and then glue them in a pile or group at the other end. Punch a hole in the front corners with a pin. Run a piece of fishing line through the holes so you can wear the board around your neck. It will rest against your stomach. Wear a red wig under the chef hat. Wear a ‘50s-style dress under the lab coat. Have a partner dress as Ethel or Desi for a greater effect.